Home→Announcements→Election & Annual Meeting: Tuesday, March 13! 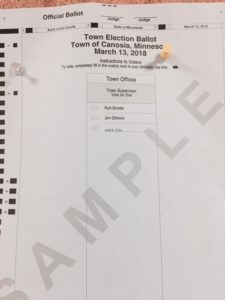 On the second Tuesday in March each year, Canosia Township holds its town board election and Annual Meeting. This year’s “Township Day” will take place on Tuesday, March 13. Our town board is comprised of three supervisors serving three-year terms. 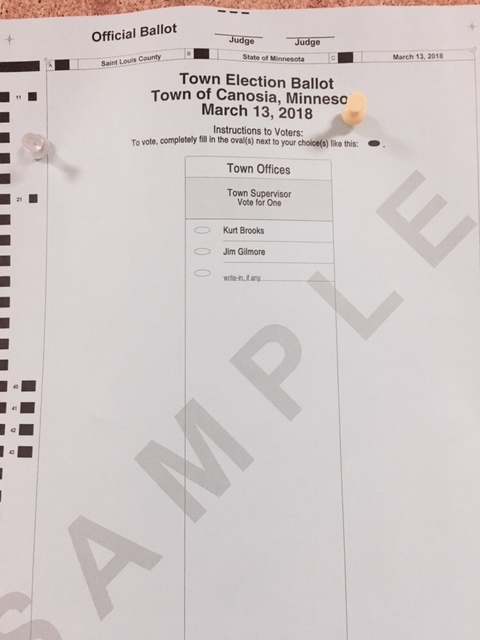 Every March one town board supervisor seat is up for election. This year there will be two candidates on the ballot: Kurt Brooks and Jim Gilmore. On Election Day, the polls will be open from NOON to 8 p.m. at the town hall (4896 Midway Rd.). Residents are also welcome to vote absentee ahead of time if they prefer. To do so, please contact the clerk at 590-6746 or canosiatownship@yahoo.com for an absentee ballot application. The town clerk’s office will also be open on Saturday, March 10 from 10 a.m. to noon for absentee voting. Election results will be announced during the Annual Meeting which begins at 8:30 p.m. The Canosia residents in attendance will determine the 2019 levy amounts for the three major township funds: General, Fire Department, and Road & Bridge. The Fire Department has agreed to accept a temporarily reduced levy amount for two years to allow the township to cover the costs of some upcoming road improvement projects and balance the reserve levels in each of the funds. To clarify, the Fire Department’s budget would be the same even though their levy amounts would go down. At the January Budget Meeting, the supervisors thanked the Fire Chief for his cooperation in making sure all township needs are met. The township property tax levy has not gone up since 2009 and actually decreased in 2011 to the current $297,200 level. As you may know, the residents determine the levy amounts for the three major funds listed above, but the decisions on how to spend the money within those funds is then the responsibility of the township board. The Annual Meeting is also a good opportunity to get updates from all departments and hear about upcoming events and initiatives. We hope to see you there on Tuesday, March 13 at 8:30 p.m. In the case of extremely bad weather, Township Day will be postponed until the following Tuesday, March 20.